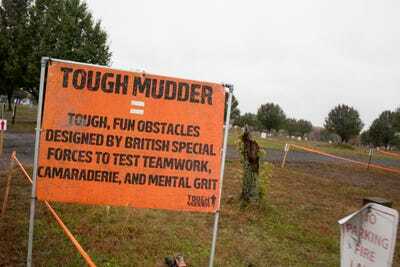 Since Tough Mudder was founded in 2010, 1.3 million people have participated in one of the company’s “military style” obstacle courses, which cover 10 to 12 miles of ground and include about 20 different challenges. 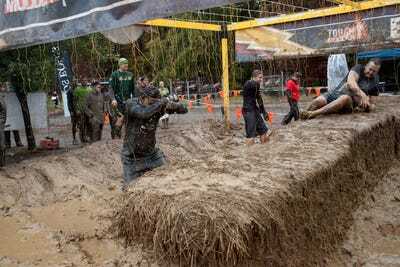 The event is part of a growing “obstacle course” trend among fitness enthusiasts and weekend warriors. 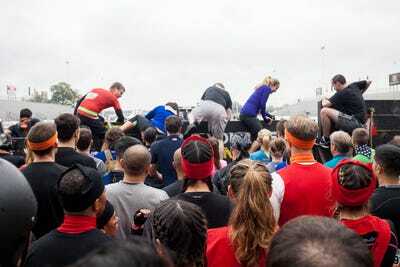 There is no shortage of similar competitions, including the Spartan Race, the Warrior Dash, the Colour Run, and the Superhero Scramble. All cater to people yearning to do something extraordinary. 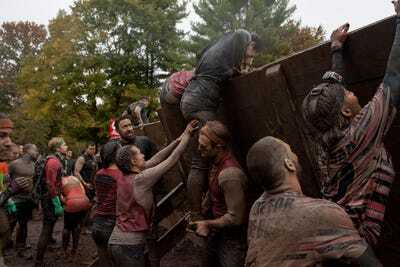 A common refrain in marketing materials, from employees, and from “Mudders” is to get up off the couch and “overcome your fears.” It costs between $US125 and $US500 to participate in a race. 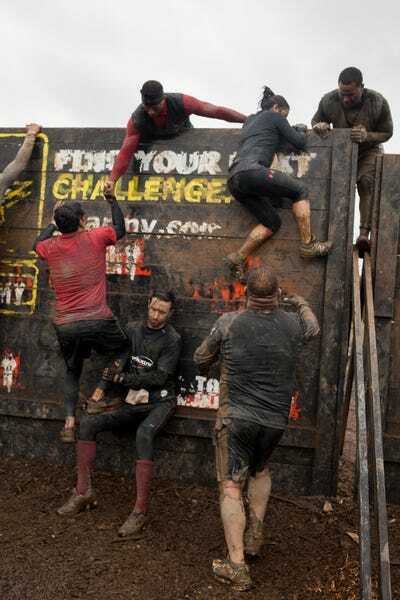 For first-timers, who make up the majority of Mudders at any event, it’s about overcoming a challenge and team-building. 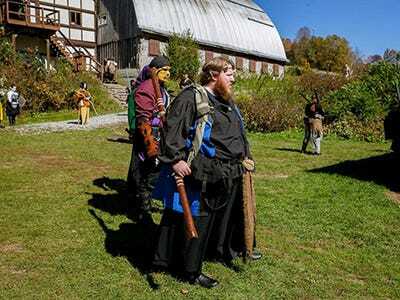 Most people participate with a team, some with friends, some with coworkers, and others with random groups of people assembled specifically for the event. 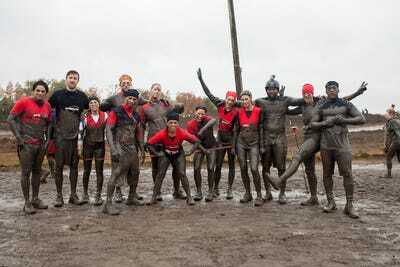 We followed one group — the Brooklyn Fitness Team — from training through the event to see what it takes to prepare and run a Tough Mudder. Prior to the start of the race, all the participants gathered in a mob before the starting area. Music blasted over the PA, and an announcer tried to get people pumped up. 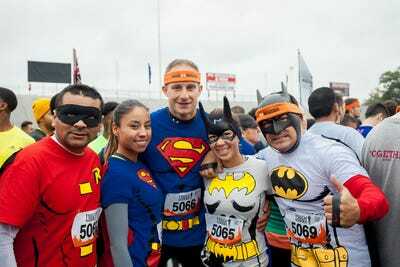 We met more than a few teams whose members were dressed in costumes, like these superheroes. 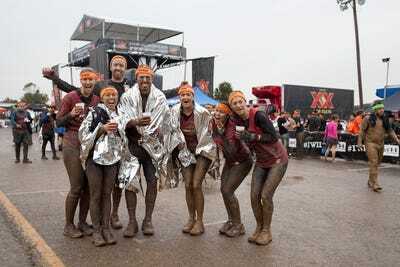 Once in the start chute, everyone gathered around the emcee, Sean Corvelle, an actor and stand-up comedian, who is now one of the main motivators for Tough Mudder. After giving Corvelle a high-five, the team was off. The runners nearly sprinted the first mile of the course. It was tough to keep up. Everyone on the team is a former collegiate or high school athlete. Among the sports: soccer, baseball, track, tennis, basketball, swimming, and power lifting. 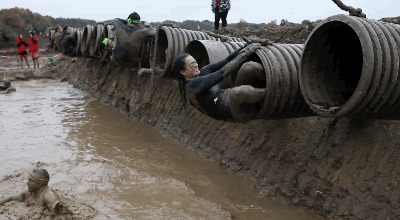 The first obstacle was The Pitfall, two giant pits of chest-high freezing mud. 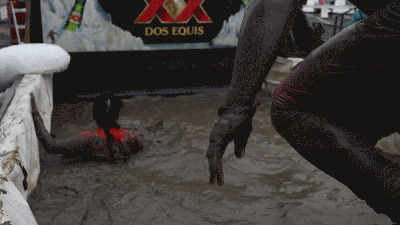 It was a baptism-by-mud for the team. 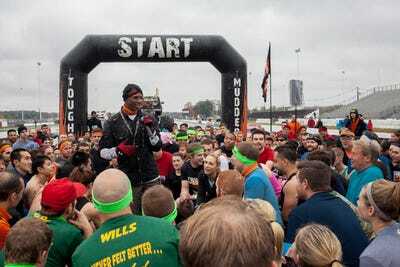 More than a few Mudders were shocked by the initial temperature. But the Brooklyn team stayed in high-spirits. 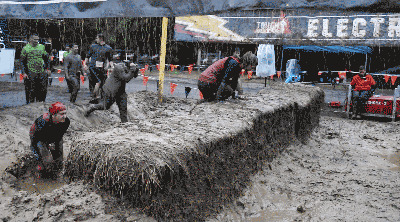 The next part of the course has no name but is certainly an obstacle. It's approximately a mile of hills over what looks like a dirt bike track. At the end is The Cliffhanger, a tall hill canted at a 45 degree angle. You practically have to sprint up the hill and then work together with your teammates to pull one another up. The way down looked like more fun. Then it was time to go back in the mud for the Mud Mile, multiple chest-high mud pits that you have to climb in and out of. 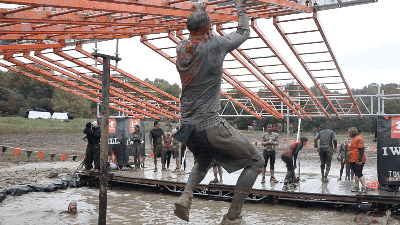 The Arctic Enema is one of Tough Mudder's buzziest obstacles. 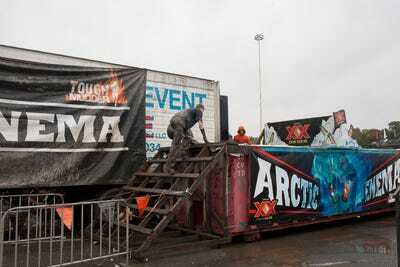 The obstacle consists of a dumpster filled with water cooled with pounds of ice to a temperature of 34 degrees. Participants must jump into the dumpster and swim under a wooden wall to get to the other side. Almost everyone on the team said that it was the obstacle they were looking forward to the least. It didn't help that one of the volunteers kept adding ice as the team jumped in. After a short run, the team came to Balls To The Wall, a pretty straightforward rope climb over a wall. There was a long line before the team could go, however, which left the team members shivering as they waited. 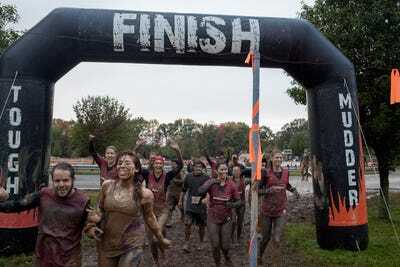 The Kiss of Mud, a crawl through the mud under barbed wire, was easy for the team. The competitors were pretty used to the cold temperatures at that point. The Funky Monkey looked like the most physically challenging event of the day. 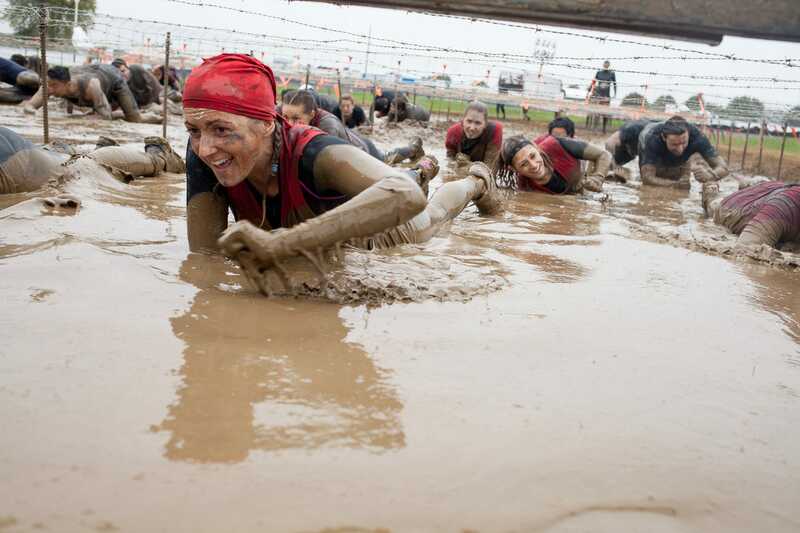 Participants cross a 15-to-20-foot pool via a set of inclined and declined monkey bars, greased with mud and butter. 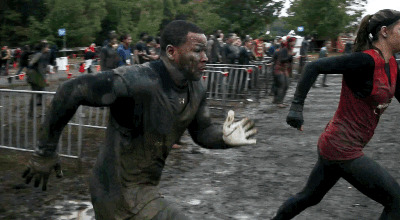 According to Tough Mudder, only 40% of participants complete the challenge. Not even Bozeman was able to finish the Funky Monkey. Most people just swam across the pool. Seetram got across with major kudos from the team. Next came the Berlin Wall, a 12-foot high wooden wall. The strongest team members went first and then stayed at the top to help everyone over. Teamwork was a core strategy for the day. One of the most interesting challenges of the day was Pyramid Scheme. To scale the slightly inclined wall, team members have to work together to form a human pyramid so that one member can scramble to the top and help pull the others up. People worked with other teams to complete the task. Everest looked difficult but like a ton of fun. Participants have to scale the slick 15-foot quarter pipe any way they can. Most people tried sprinting and then jumping at the last moment to catch a team member's hand. More than a few people fell on their face. Walk The Plank is a standard high-dive into a muddy pool, but after several hours of being cold and wet, it did not look appealing. The team started flagging when we hit Sewage Outlet, a claustrophobic crawl under barbed wire through a pipe and into a pool. Everyone was tired, and a few people skipped out on the challenge. Those who completed the challenge were pretty confused on how to drop into the 5-foot pool that greeted them on the other side. The Devil's Beard looked easy, until you tried to lift the net. The team had to work together to get to the other side. The team got split up before Glory Blades, the second-to-last challenge. A few team members had decided to walk the rest of the course, and one or two dropped out because of injury. We heard more than a few other contestants calling it quits. 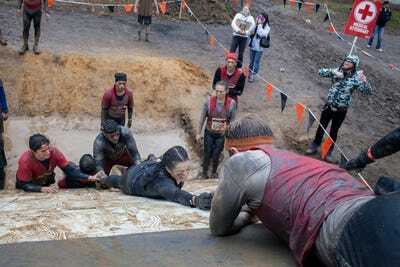 The last challenge of the day (and the most painful) was Electroshock Therapy, a run through a field of live wires pumping with 10,000 volts of electricity. Corvelle, the emcee, was there cheering everyone on, but only a few of the Brooklyn team members had the stomach for it. Everyone who went in got shocked badly. Team member Robert Azapinto said it hurt just as bad as he was expecting. 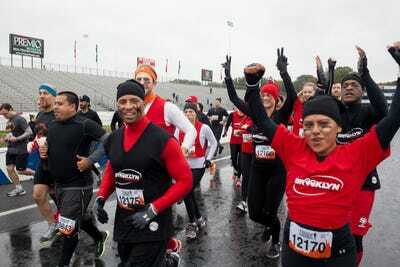 Here's the first group of finishers from the Brooklyn team. 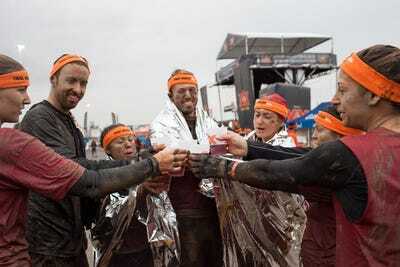 Volunteers wait at the finish line to greet Mudders with an orange headband, a beer, and a meal replacement bar. The Brooklyn team was pretty stoked about finishing. 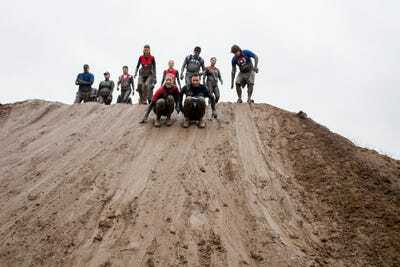 Team members said that on a difficulty scale from 1 to 10, the course was about a 7. 'This was the most uncomfortable I've been in my life. 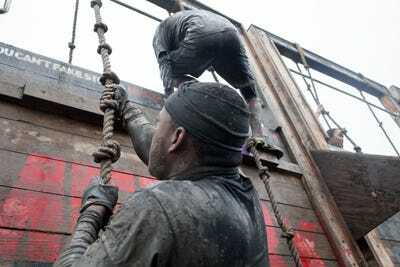 It's not anything you can actually train for,' one team member said of the cold, wet conditions. Most said they would do it again though, especially if it were summertime. 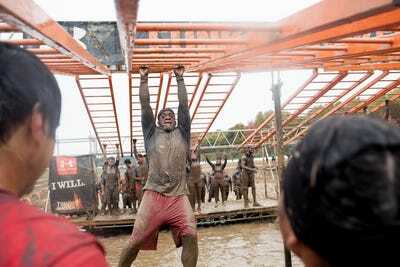 BONUS: From a Tough Mudder in Vermont, this picture is says it all.